Be the star or just watch the fun! Master hypnotist Jim Kellner leads you on an exploration of the mind and the power of hypnosis. TACOMA, Wash. - March 19, 2018 - PRLog -- Have you ever wondered what hypnosis is really like? Have you wanted to experience it for yourself? Do you like to laugh your a$$ off? Then this is THE show for you. 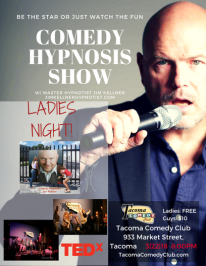 Master Hypnotist Kellner is appearing at Tacoma Comedy Club on the heels of his TEDx talk in February, 'If you can't be hypnotized, you lose'. He currently travels the US and has hypnotized people from all over the world. He is one of only a handful of hypnotist to ever take the TEDx stage. Every one of Kellner's comedy hypnosis shows is interactive, hilarious, and mind-bendingly fun. You'll be astonished at the power of the mind. Be the star of the show or watch your friends, family members, and complete strangers take the stage and amaze you with a journey of the mind. Will you take the journey? Comedy Hypnotist is Back in Arizona!